Whenever I see someone use the word "surely", I figure the writer isn't very sure about, or doesn't have real evidence to support, what they are about to say. I'm guilty of it sometimes myself. People's appetites differ for a lot of reasons, many of them without negative health implications. Genetics is one example that can alter metabolic rate and therefore hunger (remember the ob/ob mice who ate more but didn't live shorter lives). Exercise or exposure to cold (and extra brown fat that cold exposure can create/promote) will increase calorie expenditure without detrimental effects. In fact, perhaps my favorite study of all time (except for the suffering of the animals involved) was the famous "rats with cold feet" study  by John Holloszy. Holloszy found that rats who lived their lives standing in a cold puddle of water ate 44% more than normally-housed rats, but nonetheless stayed thin and didn't live any shorter lives than the normally-housed rats. In fact they lived slightly longer and got less cancer. Our friend Josh Mitteldorf did a whole blog post about the hormetic benefits of cold exposure, and how it casts serious doubt (if not debunks) the popular "rate of living" theory of aging. J Appl Physiol (1985). 1986 Nov;61(5):1656-60. Longevity of cold-exposed rats: a reevaluation of the "rate-of-living theory". concept that increased energy expenditure decreases longevity. Translating animal model research: does it matter that our rodents are cold? Maloney SK, Fuller A, Mitchell D, Gordon C, Overton JM. Physiology (Bethesda). 2014 Nov;29(6):413-20. doi: 10.1152/physiol.00029.2014. Review. Does it matter that rodents used as preclinical models of human biology are routinely housed below their thermoneutral zone? We compile evidence showing that such rodents are cold-stressed, hypermetabolic, hypertensive, sleep-deprived, obesity-resistant, fever-resistant, aging-resistant, and tumor-prone compared with mice housed at thermoneutrality. The same genotype of mouse has a very different phenotype and response to physiological or pharmacological intervention when raised below or at thermoneutrality. The rodent models that have attracted public attention, perhaps more than any others, are those demonstrating artificially enhanced longevity. Engineering a mouse's hypothalamus to overproduce uncoupling protein 2 results in the local production of heat in the hypothalamus. Because the hypothalamus is the most thermosensitive region in the mammalian body and provides the majority of the input signal for thermoregulation (26), the local heating results in a lower than normal Tb everywhere else in the body. Those engineered mice also live longer than normal (14), providing evidence of an association between Tb, energetics, and longevity (3). There are other mouse genotypes that live longer than average. These genotypes produce dwarf strains, and their LCTs are higher than those of the average mouse. They tend to have lower Tb than normal mice, even at Ta of 26°C (7). The hypopituitary Ames and Snell strains live for ~1,150 days compared with 720 days for a normal mouse (8). In dwarf mice, the longevity appears to be related to increased metabolic rate (3). The long-lived growth hormone-resistant (GHR-KO) strain has a metabolic rate higher than that of wild-type mice when housed at 23°C but not when housed at 30°C (3), implying that enhanced longevity would not be evident in the TNZ. That implication is manifested in the C57Black-6 (B6) strain of mouse that lives for ~785 days (35) when its lifespan is extended by calorie restriction (CR). Placing B6 mice onto a CR diet, where they receive 60% of their normal daily energy requirement, extends their life to ~1,148 days at 21°C (35). If the B6 mice are fed a CR diet at thermoneutrality, they live for ~810 days, not significantly different from the 785 days of the control-fed mice (35). So CR does not extend lifespan in B6 mice in their TNZ. Koizumi (35) thought that the explanation lay in the restricted use of torpor at the higher Ta, but Bartke (3) reports that the long-lived genotypes do not use torpor and thus maintain a high metabolism when they are exposed to 21°C. There is clearly much we do not understand about the interactions between Ta, Tb, metabolism, and longevity." The paper you just posted above (PMID: 25362635) is a goldmine of interesting information relevant to the benefits of cold exposure! Thanks so much for sharing it. Placing B6 mice onto a CR diet, where they receive 60% of their normal daily energy requirement, extends their life to ~1,148 days at 21°C [72 DegF] (35). If the B6 mice are fed a CR diet at thermoneutrality [86 DegF], they live for ~810 days, not significantly different from the 785 days of the control-fed mice (35). 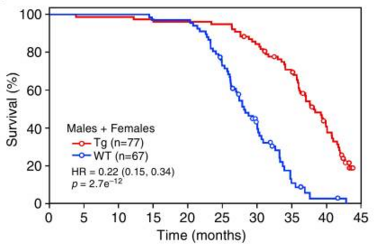 So CR does not extend lifespan in B6 mice in their TNZ [thermal neutral zone]. Koizumi (35) thought that the explanation lay in the restricted use of torpor at the higher Ta [ambient temperature - i.e. Walford, Koizumi et al thought rodents didn't go into hibernation-like state as a result of CR if housed in warm conditions and so didn't live longer], but Bartke (3) reports that the long-lived genotypes do not use torpor and thus maintain a high metabolism when they are exposed to 21°C. In dwarf mice, the longevity appears to be related to increased metabolic rate (3). The long-lived growth hormone-resistant (GHR-KO) strain has a metabolic rate higher than that of wild-type mice when housed at 23°C but not when housed at 30°C (3), implying that enhanced longevity would not be evident in the TNZ. This accords with the "rats with cold feet" study (pmid 3781978) I discussed above, where rats ate 44% more calories and burned them to stay warm while standing in cold water. As a result they had a higher metabolic rate, stayed thin and lived just as long as rats that were kept warm and ate 44% fewer calories. I strongly suspect calories burned to stay warm are burned more "cleanly" than calories burned to support normal metabolic processes, and hence aren't (as) detrimental to health / longevity. Way back in the heyday of the CR email list, I spent several months trying to wrap my head around the likely mechanism for this "free lunch" for calories burned to stay warm. I've always suspected, and still suspect, it has to do with uncoupling proteins - which open up channels to allow protons to leak through the mitochondrial membrane, which generates heat in the process, but does not contribute to the production of the cell's energy storage/transport molecule ATP (hence the name 'uncoupling proteins' since they uncouple proton movement across the mitochondrial membrane from the normal process of ATP generation). It was all extremely complicated, and recent reviews of the role of uncoupling proteins in aging and longevity , seem to support the idea that they are indeed important, but exactly how and why is still somewhat of a mystery. But there is ample evidence (e.g. and ) that cold exposure increases uncoupling protein expression. But the benefits of cold exposure could (also) result from an entirely different mechanism, like hormesis-induced upregulation of beneficial heat shock proteins, or simply enabling one to stay thin, thereby reducing lifetime obesity burden and so live longer. But regardless of how cold exposure works, whether it is through less damage, better repair, or some other mechanism entirely, it appears that it may indeed increase lifespan relative to thermal neutral conditions, even in (especially in?) CRed mammals. Makes me feel less resentful of living in a place where the high temperature tomorrow is going to be 14 degF (-10C). No problem getting exposed to cold here! Stay thin, stay cold, live long and prosper. Curr Aging Sci. 2010 Jul;3(2):102-12. Uncoupling protein-2 and the potential link between metabolism and longevity. (1)Department of Physiology, Monash University, Clayton, VIC 3183 Australia. promotes longevity by shifting a given cell towards fatty acid fuel utilization. The role of mitochondrial uncoupling proteins in lifespan. could decrease the cellular damage that occurs during aging due to excess of ROS. This review will focus on the evidence supporting these mechanisms. Am J Physiol. 1987 Feb;252(2 Pt 1):E237-43. Trayhurn P, Ashwell M, Jennings G, Richard D, Stirling DM. decreasing temperature between thermoneutrality (29 degrees C) and 4 degrees C.
therefore be dissociated from the amount of the protein. Int J Biochem Cell Biol. 1998 Jan;30(1):7-11. Palou A(1), Picó C, Bonet ML, Oliver P.
Illes Balears, Palma de Mallorca 07071, Spain. could be an effective strategy against obesity. But are mice in the TNZ in CR at all as they are no longer spending so much energy heating their bodies? Is there an experiment that compared raising mice in TNZ and below TNZ that calibrated intake so the two groups weighed the same? This would be better for our purposes as it would - for a given bodyweight - compare the decision to eat more to combat cold to eating less but staying warm. But are mice in the TNZ [thermal neutral zone - i.e. warm conditions] in CR at all as they are no longer spending so much energy heating their bodies? Is there an experiment that compared raising mice in TNZ and below TNZ that calibrated intake so the two groups weighed the same? This would be better for our purposes as it would - for a given bodyweight - compare the decision to eat more to combat cold to eating less but staying warm. or to an energy-restricted group maintained at 30°C (ERI/B6). (175 kJ) of the ERI diet. minerals but less carbohydrate than the corresponding controls. So the control mice housed as cool temperatures received 27g of food, the cool-housed CR mice received 17g (40% less than controls), and the warm-housed CR mice received 13g of food, ~20% less than the cool-housed CR mice to account for the fewer calories they needed to burn to keep warm. As you can see, the control mice gained a lot of weight over their lifespan, at their peak weighing twice as much as the two CR groups. But the calorie titration between the two CR groups was effective at matching body weight, despite different caloric needs (and intake) to compensate for the difference in calories spent for thermal regulation. These results are striking. The mice housed at thermal neutrality (ERI/B6), eating less than half the calories and weighing half as much as the control mice housed in cool conditions (Ct/B6), had a median survival time that was statistically indistinguishable from the control mice - 810 vs. 778 days. 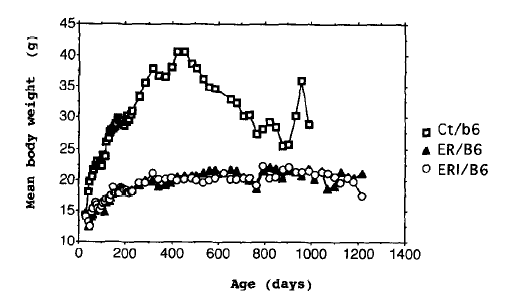 To their credit, the maximum lifespan of the warm-house CR mice was extended relative to the controls, as you can see. In contrast, the CR mice housed at a cool temperature (ER/B6), also weighed half as much as controls, and who ate 20% more calories than the weight-matched warm-housed CR mice, had a median lifespan 40% longer than either the cool-housed controls or the warm-housed CR mice (1143 days). They ended the study when the last of the warm-house CR mice died, at which point 8 of the cool-housed CR mice were still alive, so the maximum lifespan for the cool-housed CR mice was pretty much guaranteed to be extended relative to the warm-housed CR mice. The authors interpreted these results to imply that torpor was required for CR benefits. But as the review discussed above (PMID: 25362635) suggests, long-lived mice don't exhibit torpor when exposed to the temperature used in this study, but instead maintain a higher metabolic rate to stay warm, as implied by the 20% extra calories the cool-housed CR mice required to maintain the same weight as the warm-housed CR mice in this study. But again, whatever the mechanism, this study seems to show that for this commonly-studied strain of mice, housing them at what is for them a thermally neutral temperature erases all the longevity benefit of CR (at least for the average animal), even when their food is restricted enough to keep them very thin relative to cool-housed controls. Or put another way, CR and cold exposure was required to extend the median lifespan of these animals - CR without cold exposure didn't cut it. Mech Ageing Dev. 1996 Nov 29;92(1):67-82.
temperature through deprivation of torpor. M, Sasaki M, Miyamaura Y, Abe T, Ohtomo K, Walford RL. Thanks Dean, that is a remarkable result and quite counter-intuitive. I will make one quibble: the longest lived 1/3 or so of the ERI (warm housed) mice - those who presumably adapted well to the diet - did live longer (about 1100 days) than the equivalent 1/3 of the controls (900) if not the ER (cooler housed but fed more) mice (1250). I agree Martin. Quite a surprising result, but not inconsistent with the overall picture that there is definitely something more than "calories, calories, calories" going on with CR. I will make one quibble: the longest lived 1/3 or so of the ERI (warm housed) mice - those who presumably adapted well to the diet - did live longer (about 1100 days) than the equivalent 1/3 of the controls (900) if not the ER (cooler housed but fed more) mice (1250). No need to quibble, I acknowledged the same thing in my synopsis of the study when I said "To their credit, the maximum lifespan of the warm-house CR mice was extended relative to the controls". But notice that at around 900 days, only those 1/3rd well-adapted and therefore longest-lived warm-housed CR mice are still alive, while at that same time point about 3/4 of cool-housed CR mice are still alive. Do you really want to bet that you'll be one of the lucky few whose CR response kicks in when living in thermally neutral conditions? CRed mice housed at what for them is an uncomfortably cool temperature ate 20% more, weighted the same, and lived 40% longer on average than CRed mice housed at a comfortably temperature. So much for "calories, calories, calories". And contrary to my recent contentions, this data suggests CR involves more than just obesity avoidance, since the warm mice avoided obesity but didn't live any longer on average than the controls. One could speculate that cold stress on top of an energy deficit is required to kick the metabolism into CR mode, at least in these mice. As you suggested, a pretty startling result. Yes - that is sci-hub.io. Its probably asking you to input a captcha to prove you're a human before it will show you the full text of the paper. From what I remember of the discussions on the email list over longevity benefits of exercise vs CR there wasn't much of a conclusion but the rodent evidence tended toward exercise not helping for a given bodyweight (i.e. increased intake to counter the extra expenditure) and even for no compensating increase in intake leading to decreased weight. Why body heat production - which is akin to exercise it seems to me - would be different is a mystery. Why body heat production - which is akin to exercise it seems to me - would be different is a mystery. Uncoupling proteins, either UCP1 in brown adipose tissue (aka BAT or 'brown fat'), or UCP3 in muscle tissue (to a lesser extent - see below), are a major mechanism by which the body generates heat for thermoregulation. Proton leakage across the mitochondrial membrane, mostly controlled by these UCPs, accounts for 20-30% of the resting metabolic rate in rats  - so they have a big effect! It was once thought that adult humans had little brown fat, and therefore little UCP1, and that there was nothing that could be done to change that. But recently it was discovered that not only do we have BAT, but the level of brown fat in the human body can be increased via cold exposure. You've just gotta love the name of this study - it's called the "Impact of Chronic Cold Exposure in Humans (ICEMAN)" study . In it, researchers found that having men sleep in a cool room (66F) for a month increased brown fat levels and activity by 42% relative to thermal neutral sleeping, as well as improved insulin sensitivity and glucose metabolism. In contrast, sleeping in a warm (81F) room decreased the level of brown fat and its metabolic activity by about 20% in the men. So like in rodents, it appears brown fat and UCP1 can be increased in humans via cold exposure, which is likely to be a good thing based on the rodent longevity data discussed in previous posts, not to mention the finding from  of improved insulin sensitivity. But what about UCP3, which we have much more of than UCP1 and which is the homolog of UCP1 but which occurs in skeletal muscles rather than (or in addition to) brown fat? What does UCP3 do and what influences UCP3 expression? Unlike UCP1, it is not clear that UCP3 contributes significantly to thermal regulation , despite the fact that it can indeed uncouple the ATP synthesis process in mitochondria just like UCP1, and hence contribute to heat generation. Its true role doesn't appear to be very clear, according to review article , but it definitely seems to reduce ROS generation in the mitochondria of skeletal muscles, and thereby protect mitochondria from oxidative damage, which is a very good thing. Other known or suspected benefits of UCP3 upregulation are shown in the diagram above. So what can be done to upregulate UCP3 levels in muscles? Cold exposure appears to only modestly (if at all ) and perhaps only temporarily increase the level of UPC3 in muscles , more as a result of increased energy expenditure than via a direct increase in expression of mRNA for UCP3, which strangely was actually downregulated by cold. What appears to be happening is that cold exposure , exercise , fasting , and particularly the combination, i.e. exercising in the fasting state , increases the level of free fatty acids in muscle cells (FFAs are used by muscles as fuel when glucose isn't available), and it is these FFAs that facilitate the expression of of UCP3 mRNA, and subsequently increase UCP3 levels in muscle cells. TL;DR - Cold exposure, fasting, exercise, and especially exercise in the fasted state can upregulate the two major uncoupling proteins, UCP1 and UCP3. These proteins appear to enable the body to burn calories more "cleanly", reducing oxidative damage and increasing insulin sensitivity. Upregulation of these proteins are likely just one of several pathways by which cold exposure, fasting and exercise have beneficial effects on health and longevity. Diabetes. 2014 Nov;63(11):3686-98. doi: 10.2337/db14-0513. Epub 2014 Jun 22. W(3), Werner CD(1), Chen KY(1), Celi FS(4). humans, opening avenues to harnessing BAT for metabolic benefits. Front Physiol. 2015 Feb 10;6:36. doi: 10.3389/fphys.2015.00036. eCollection 2015. Mitochondrial uncoupling proteins and energy metabolism. Busiello RA(1), Savarese S(2), Lombardi A(3). e Farmaceutiche, Seconda Università degli Studi di Napoli Caserta, Italy. (3)Dipartimento di Biologia, Università degli Studi di Napoli Napoli, Italy. critical for the development of new treatments for obesity and related diseases. enhancement of this process represents a potential target for obesity treatment. Am J Physiol Endocrinol Metab. 2002 Jan;282(1):E11-7. 0.05), whereas glucose oxidation was higher after glucose ingestion (P < 0.05). prolonged elevation of plasma FFA levels and/or increased fatty acid oxidation. 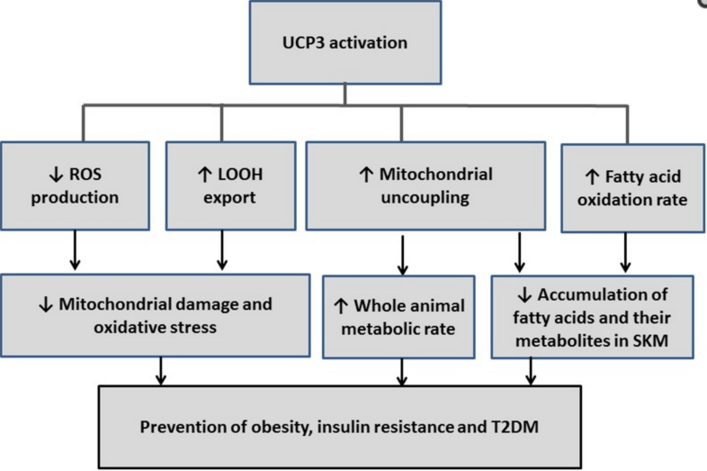 OBJECTIVE: In rodents, adaptive thermogenesis in response to cold exposure and high-fat feeding is accomplished by the activation of the brown adipose tissue specific mitochondrial uncoupling protein, UCP1. The recently discovered human uncoupling protein 3 is a possible candidate for adaptive thermogenesis in humans. In the present study we examined the effect of mild cold exposure on the mRNA and protein expression of UCP3. DESIGN: Subjects stayed twice in the respiration chamber for 60 h (20.00-8.00 h); once at 22°C (72°F), and once at 16°C (61°F). After leaving the respiration chamber, muscle biopsies were taken and RT-competitive-PCR and Western blotting was used to measure UCP3 mRNA and protein expression respectively. RESULTS: Twenty-four-hour energy expenditure was significantly increased at 16°C compared to 22°C (P<0.05). At 16°C, UCP3T (4.6±1.0 vs 7.7±1.5 amol/µg RNA, P=0.07), UCP3L (2.0±0.5 vs 3.5±0.9 amol/µg RNA, P=0.1) and UCP3S (2.6±0.6 vs 4.2±0.7 amol/µg RNA, P=0.07) mRNA expression tended to be lower compared with at 22°C, whereas UCP3 protein content was, on average, not different. However, the individual differences in UCP3 protein content (16-22°C) correlated positively with the differences in 24 h energy expenditure (r=0.86, P<0.05). CONCLUSION: The present study suggests that UCP3 protein content is related to energy metabolism in humans and might help in the metabolic adaptation to cold exposure. However, the down-regulation of UCP3 mRNA with mild cold exposure suggests that prolonged cold exposure will lead to lower UCP3 protein content. What the function of such down-regulation of UCP3 could be is presently unknown. Human mRNA response to exercise and temperature. Slivka DR(1), Dumke CL, Tucker TJ, Cuddy JS, Ruby B.
presents evidence of PGC-1α temperature sensitivity in human skeletal muscle. J Appl Physiol (1985). 2006 Jul;101(1):12-3. Tough love: left out in the cold, but not abandoned, by UCP3. J Appl Physiol (1985). 2006 Jul;101(1):339-47. In my last post, I said the uncoupling proteins UCP1 and UCP3 are likely to be just one of several pathways that cold exposure, fasting and exercise might increase health and longevity. Here is another, very interesting one. These data suggest that FGF21 may extend lifespan by regulating a small subset of genes also regulated by caloric restriction in [the] liver. So if FGF21 is a CR mimetic, how might we upregulate it with having to wait for gene therepy? But in addition, cold exposure (66F vs controls at 75F for 12h) apparently upregulates FGF21 expression in people by 37%, and this increase in FGF21 predicted increase in 24h energy expenditure . Finally, exercise has also been shown to increase the level of FGF21 in humans . In fact, two weeks of treadmill exercise increased FGF21 levels by 66% in healthy young women tested in . So here again we see that three mild stressors, intermittent fasting, cold exposure and exercise, can increase the level of a master hormone (FGF21), the overexpression of which has proven to dramatically increase health and longevity in rodents. Elife. 2012 Oct 15;1:e00065. doi: 10.7554/eLife.00065. The starvation hormone, fibroblast growth factor-21, extends lifespan in mice. MJ, Wei W, Wan Y, Yu RT, Evans RM, Kliewer SA, Mangelsdorf DJ. extend lifespan in other species.DOI:http://dx.doi.org/10.7554/eLife.00065.001. Lee P(1), Brychta RJ, Linderman J, Smith S, Chen KY, Celi FS. Clinical Research Center, 10 Center Drive, Bethesda, Maryland 20892, USA. circulating FGF21 levels are unknown. circulating FGF21 and its relationship with CIT and lipolysis in humans. intervention study at the National Institutes of Health Clinical Center. PARTICIPANTS: Participants were healthy adults. and adipose tissue microdialysis glycerol concentrations were evaluated. pg/ml, P < 0.0001] before rising at 1900 h [60 (11-81) pg/ml, P < 0.0001]. 0.66, P = 0.027), independent of age, gender, fat mass, and lean mass. cold-induced metabolic changes similar to those in animals. PLoS One. 2012;7(5):e38022. doi: 10.1371/journal.pone.0038022. Epub 2012 May 31. Exercise increases serum fibroblast growth factor 21 (FGF21) levels. FJ, Mehta R, Oseguera-Moguel J, Aguilar-Salinas CA. unknown if FGF21 serum levels are affected by exercise. METHODOLOGY/PRINCIPAL FINDINGS: This was a comparative longitudinal study. significantly increased after two weeks of exercise (276.8 ng/l (142.8-568.6) vs.
related to the adrenergic and lipolytic response to exercise. PLoS One. 2013 May 7;8(5):e63517. doi: 10.1371/journal.pone.0063517. Print 2013. Acute exercise induces FGF21 expression in mice and in healthy humans. Kim KH(1), Kim SH, Min YK, Yang HM, Lee JB, Lee MS.
of Medicine, 50 Irwon-dong Gangnam-gu, Seoul, Korea. affects glucose and lipid metabolism by increasing glucose uptake and lipolysis. serum of healthy male volunteers performing a treadmill run at 50 or 80% VO2max. lipolysis in addition to increased catecholamines and reduced insulin. None of us actually possesses very much brown fat. It’s estimated that healthy adults typically have only 50 to 60 grams of it, located mostly in the neck around the collar bones. Small amounts of it can also be found along the spine. This can burn at least 200 kilocalories a day – which doesn’t seem like a lot. That’s the caloric equivalent of about four Timbits. But over time, that’s sufficient enough to have a profound effect on a person’s body weight. His research shows this same effect [converting muscle stem cells to brown fat cells] occurs by simply exposing mice to cold. “They shiver, and the muscle stem cells turn into brown fat,” he says. “Of course, all of us would be quite thin if it weren’t for central heating,” he adds. The fact we can maximize the calorie-burning power of brown fat simply by being chilly certainly sounds alluring. Unfortunately, ramping up our brown fat through cold exposure isn’t ideal. “People don’t really want to sit around in their underwear in their house at 5 or 10 degrees Celsius because it’s uncomfortable,” Steinberg says, adding that cold exposure also prompts people to eat more, which would likely offset any benefits. It seems to me the researcher underestimates the lengths to which some of us will go. It is the Holy Grail of health research, discovering the key to help people live longer. Now scientists believe they may be one step closer. A team at Yale School of Medicine have identified a hormone, produced by the thymus glad, extends lifespan by 40 per cent. Their findings reveal increased levels of the hormone, known as FGF21, protects the immune system against the ravages of age. Researchers said the study could have implications in the future for improving immune function in the elderly, for obesity, and for diseases such as cancer and type 2 diabetes. When it is functioning normally, the thymus produces new T cells for the immune system. But with age, the gland becomes fatty and loses its ability to produce the vital cells. This loss of new T cells in the body is one cause of increased risk of infections and certain cancers in the elderly. Researchers led by Vishwa Deep Dixit, professor of comparative medicine and immunobiology at Yale, studied transgenic mice with elevated levels of FGF21. They blocked the gene's function, before studying the impact of decreasing levels of FGF21 on the immune system. Their results showed that increasing the level of FGF21 in old mice protected the thymus from age-related fatty degeneration and increased the ability of the thymus to produce new T cells. Meanwhile, FGF21 deficiency accelerated the degeneration of the thymus in old mice. Professor Dixit said: 'We found that FGF21 levels in thymic epithelial cells is several fold higher than in the liver, therefore FGF21 acts within the thymus to promote T cell production. Professor Dixit added that FGF21 is produced in the liver as an endocrine hormone. Its levels increase when calories are restricted to allow fats to be burned when glucose levels are low. FGF21 is a metabolic hormone that improves insulin sensitivity and also induces weight loss. Therefore it is being studied for its therapeutic effects in type 2 diabetes and obesity. Professor Dixit said future studies will focus on understanding how FGF21 protects the thymus from aging, and whether elevating FGF21 through the use of drugs, could extend human lifespan and lower the incidence of disease caused by age-related loss of immune function. Youm YH, Horvath TL, Mangelsdorf DJ, Kliewer SA, Dixit VD. It is actually 10 micrograms, not 10 grams. But it is still amazing that you can apparently buy samples of the FGF21 hormone online from Amazon. I'm not recommending it, however. I hate the time lost dressing up and down to counteract what my body perceives as uncomfortable temperature. You might be in the middle of something (even an engaging philosophical thought) ... a shiver comes and -- bam! -- you're distracted away from that thought. Again: dead time when one has to engage in mindless manual labor of re- and de-layering! My criticisms of uncomfortably keeping cool for the sake of potential LE effects also hold for mild/deliberate sleep reduction. Sleep, on heavy CR, can be short/incomplete. E.g., premature awakening; inability to re-sleep despite feeling groggy and sleep deprived. I have found that a short nap, no less than 6 hrs before bedtime, can be restorative (this is usually immediately following a meal: there's a sleepiness/siesta window there). Sleep debt is something that is disruptive -- even dangerous -- throughout the wake cycle ... and that is QOL reduction ... i.e., "dead time." My wife always says she's cold. So much so that I gave her an electric shawl for her recent birthday (which she really like). Subjectively she's made miserable by the cold. The funny thing is that when we touch hands to compare our body temperatures, I'm almost always objectively colder than she is. But it doesn't bother me. I think I've trained myself to be indifferent to the cold, and now I find it refreshing and bracing rather than debilitating. Regarding sleep, I don't think I've seen the evidence that mild sleep restriction is beneficial and I'd be somewhat skeptical given all documented apparent downsides of lost sleep. Unfortunately the CR email list archives appear to be down for the count. But it is definitely true that CR in humans is frequently associated with sleep disturbances, or at least reduced hours spent sleeping, and the recent CR & Sleep Poll documents. I too have found a short "power nap" of about 20 minutes around mid-day makes me feel refreshed, and able operate effectively on what for me has lately become about 5:45-6h of nighttime sleep. It certainly seems like you get more bang for your buck from exercise (study focused on short duration, high intensity exercise (HIIT) in particular with otherwise sedentary people doing no other exercise). I personally don't mind 66 degrees, could keep the thermostat there all winter. I can't see myself cooling the house to 66 all Summer long though (wastes a lot of energy). But I do wonder, if you are just wearing extra layers of clothes, or burried under a big pile of blankets (when sleeping) do you really get the benefit of the cooler temps? I do think I sleep more soundly in cooler temperatures. [From PMID: 23667629] It certainly seems like you get more bang for your buck from exercise (study focused on short duration, high intensity exercise (HIIT) in particular with otherwise sedentary people doing no other exercise). Yes, but that is for FGF21 only. There is much more going on with the benefits of cold exposure (and exercise) than raising FGF21. From the evidence above, it looks to me like cold exposure may actually extend lifespan, while exercise is not believed to. But I do wonder, if you are just wearing extra layers of clothes, or buried under a big pile of blankets (when sleeping) do you really get the benefit of the cooler temps? Almost certainly not. I'm working on a big post on this very topic, but as a preview, it appears you actually have to be cold (i.e. have reduced core body temperature) to benefit. Turning the thermostat down and bundling up almost certainly defeats the purpose. Unfortunately the CR email list archives appear to be down for the count. I was just going to post on that. There's some content I posted on the List that I thought could benefit from re-posting (on this forum). Great profile picture - it's nice to see your face again after so many years! Regarding the email list archives. I couldn't agree more. They are a treasure trove of wisdom and information. It will be tragedy if they are forever unavailable. I have several hundred megabytes of the archives thanks to James Caine, but only starting in 2008 and only in raw & unparsed format - very hard to search. But everything before that, when I, Sherm, you, Saul, Warren and others were most active on the list is entirely unavailable right now, at least as far as I can tell. Brian has mentioned several times they are working on making them available again, but it's been this way for quite a while now - many months at least. That photo is from 2002. It's the only pose I could find to show all of me compressed in one small frame! About the archs ... I don't get it??? I know that less than a year ago, I could access them FULLY (I think -- at least my legacy mails were in there). IAC, I hope we get them back. There's gold in them thar hills. About cold exposure -- again, the archs would help as the topic was brought up several times -- but you bought up the Walford paper on hibernation and torpor. Recall however, at CRII, that Jamie Barger described "Calorie Restriction as a [potential] hibernation mimetic. " Michael Rae noted that the LS curves of hibernating and CR animals were similar. A few weeks ago the Cambridge Univ. weekly podcast of The Naked Scientists discussed The Hidden World of Hibernation. Though the idea of a long sleep may sound pretty tempting, animals actually put themselves through an awful lot. They are continually cooling and reheating their bodies, putting huge stress on their organs, and some even make themselves diabetic. Hibernation is clearly no picnic, and things get even Neuronsworse as, in an attempt to save energy, animals will dismantle the synapses in their brains. These are the parts of the neuron that send and receive signals and without them we’re all pretty useless. But what’s even more amazing is that when it’s time to “wake up” they’ll put them back together again, just as they were. Professor Giovanna Mallucci is a clinical neuroscientist at Cambridge University and she explains to Connie Orbach how this actually works. Giovanna - I think you’ve heard already from our other speakers, that there’s lots of processes that slow down and are shut down for hibernation including metabolism. And one way to save energy is to stop the brain using its energy and the dismantling of synaptic connections between brain cells is a way of doing that. What happens is, on cooling there is a retraction of what we call the “dendritic arbour”, you know all the connections and branches of a brain cell that’s connecting to another and the actual contacts - it’s like unplugging a plug from its socket, they are just removed so that no energy flows. When they rewarm there’s a signal to reconnect these structures; how that exactly happens is absolutely not known and very, very interesting to us but we do know a lot about the processes that drive that regenerative capacity. Connie - So let me just get this right. So what’s happening with animals in hibernation is a much more extreme version of actually something that’s happening all the time in humans and animals? Giovanna - Correct, that’s exactly right. Giovanna - So we know that in neurodegenerative diseases like Alzheimer’s, which is the prototypical disease but also many of the others. The earliest thing that happens, before you get the brain cell degeneration, is that synapses are lost and as synapses are lost memory goes down - what we call cognitive function goes down, and it’s just not clear why this is early loss of synapses which is such an important stage in these diseases, and it’s important a) because it give you symptoms and b) because it's reversible. So that’s the stage before the brain cells have died, before the neurons have died when, actually, if you can increase synapse number you can restore memory so it’s a very attractive, targetable point of intervention. And our starting hypothesis was that the reason that synapses are lost early in Alzheimer’s disease and early in Parkinson’s disease and other disorders is because there’s a failure of this regenerative capacity that is part of our normal structural plasticity. We used hibernation or induced laboratory hibernation in mice to test the ability of synapses to regenerate themselves in mouse neurodegeneration models. Connie - And what did you find out - what’s happening? Giovanna - So first of all we found very interestingly that mice which don’t normally hibernate, can hibernate in all the ways that you would normally expect. So if you cool them: they’ll drop their body temperature, they’ll dismantle their synapses and they’ll go into torpor and then, when you re-warm them, they come completely back to normal again. And what we found out was that normal mice dismantle and reassemble their synapses but the mice that we used that had neurodegeneration models - that’s Alzheimer type mice, and mice with prion disease - that’s another neurodegenerative disease. They failed to reassemble their synapses so they could unplug the plugs but they couldn’t put them back in again and this lack of degenerative capacity gives us a good idea of why there’s such an early loss in synapses. Connie - Did you get a bit deeper into this? Did you get to see the protein that’s involved - is that right? Giovanna - Yes we did. So hibernating and cooling does two things to you: it shuts down metabolism and it shuts down protein synthesis, but there’s a group of proteins that are upregulated and these are called “cold-shock proteins,” and they’re a relatively new family of proteins. And one of these which is called “RBM3”, which is RNA Binding Motif Protein 3, is highly expressed in the brain and by being upregulated during hibernation that protein keeps a number of really important critical Messenger RNAs, that you need for survival, ready to make into proteins when you wake up. And we found out that RBM3 is failing in the Alzheimer’s brain, and if we put it back in, we can rescue them. Giovanna - So, we didn’t find the protein; I mean the proteins a known cold shock protein. What we’ve done is associate it with the failure of structural plasticity in neurodegenerative disease in Alzheimer type mouse models and what we now want to do is understand the relevance for human disease. Because what we found in the mice is that if you put the protein back in it’s incredibly protective, it gives them new synapses, it stops them getting neurodegeneration, it stops them getting memory loss, and it protects them in the long term and you can do that by either cooling the mice early to boost their indodgenous or their own RBM3 levels, or by putting it in artificially. So now, obviously, this is a way in for neuroprotection for human disease but cooling itself is not realistic or practical in the long term. It is used medically; it’s used in newborn babies that have had hypoxic damage; it’s used in post-stroke and it’s used in cardiac surgery, and in many forms of neurosurgery. So we thinks that that’s acting through RBM3 and our ideal would be to be able to manipulate RBM3 levels for protection without having to cool. Regarding the archives - yes it wasn't too long ago that they were available. And as I understand it the information is definitely not lost. Perhaps Brian or Tim could give us an update and the plan (if any) to bring them back on-line. Regarding cold exposure (CE). I think I agree with you and the evidence you share regarding CE and it relationship to hibernation/turpor. H/T have both 'passive' and 'active' mechanisms and benefits. As an example of passive benefits, lower (body) temperature reduces the rate of certain harmful chemical processes in the body - perhaps processes like protein crosslinking & glycation. Active mechanisms (that actually require more fuel rather than less) might be the uncoupling of mitochondria energy production to generate heat rather than ATP, but in the process also making the mitochondrial energy production 'cleaner' (fewer free radicals generated) as a side benefit. I see CE as sort of like CR and exercise, which are both 'master stressors', that put pressure on the organism to hunker down and clean up its act to survive the ordeal. The organism responds to such challenges in a multitude of beneficial and yet-to-be-fully-elucidated ways, which improve health & longevity, at least up to a point. But beyond some point, the stress becomes too great to cope with and does permanent damage. So starving to the point at which the body catabolizes it's own vital organs, or running an ultramarathon at a pace that damages heart tissue, or freezing to the point that one's heart stops beating, are all unlikely to be helpful . The fact that hibernating animals don't live longer than "warm" animals doesn't surprise me. The conditions and impact on the body of true hibernation may be too extreme and prolonged a stressor to be beneficial, like starvation or ultramarathoning. Thanks for sharing that interview. I'd never heard of "cold shock proteins" or RBM3. Fascinating! It looks like one more mechanism by with CE might be beneficial, in this case for cognitive function by preserving synapses and neural plasticity. In the meantime, some of us are willing and able to actually do it. I always was fascinated by the "rats with cold feet" study -- it's fascinating to see that the advantages of cold exposure could be due to the raising of the FGF21 protein -- which is also raised by IF (and, I'd guess, standard CR) and exercise. My intuition: All of these may extend mean, and maybe even maximal, lifespan (in the case of "exercise", it probably matters "what kind". I'd guess that aerobic, but not strengthening, exercise is the "good" kind). Khurram, I don't like being cold either -- but it's unavoidable in Rochester, NY -- and it's nice to see that, together with CR, it's probably good for you. It will be fascinating to see further info on the role of the FGF21 protein. In the meantime, I strongly agree with Dean -- it's not a good idea to supplement FGF21.